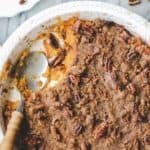 Gluten-free Sweet Potato Casserole with a delicious brown sugar, cinnamon, & pecan topping is what Thanksgiving dreams are made of! Is it wrong that I’m already thinking about Thanksgiving? I don’t think so! A gluten-free girl has got to plan ahead! I took to the kitchen early to make sure my favorite side dish would turn out just right on the big day. 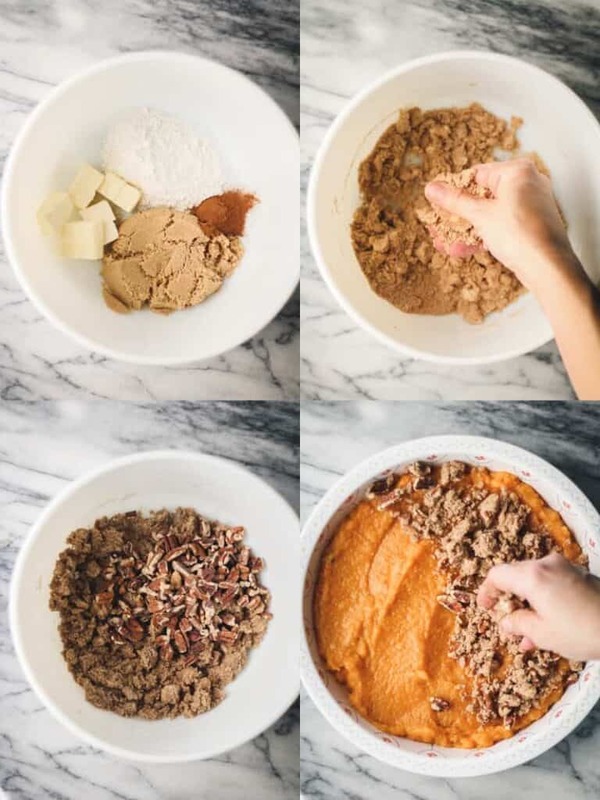 Gluten-free Sweet Potato Casserole is one of my favorite Thanksgiving sides. 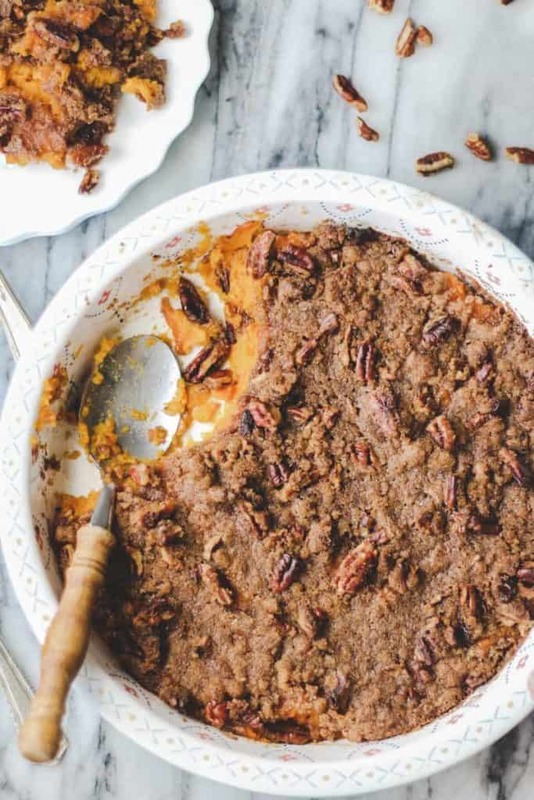 All that crispy, sugary, pecan goodness… oh, and the sweet potatoes, they’re good too. I mean anytime a vegetable can almost pass as dessert, that’s a win in my book. This dessert side is so easy to make and yet people are always impressed by it! It’s one of those tricks up my sleeve, ya know? So let’s get to it! First things first, cook some sweet potatoes. Bake ’em, boil ’em, nuke ’em, whatever you want… me? I Instant Pot-ed ’em. I usually would bake them, but this time I tried the Instant Pot. You guys, they literally only took 10 minutes in the Instant Pot! I was kind of amazed by that one. Then peel them and plop them in a bowl. Let them cool a bit first though, ok? Unless you enjoy trips to the ER. In which case, forge ahead. 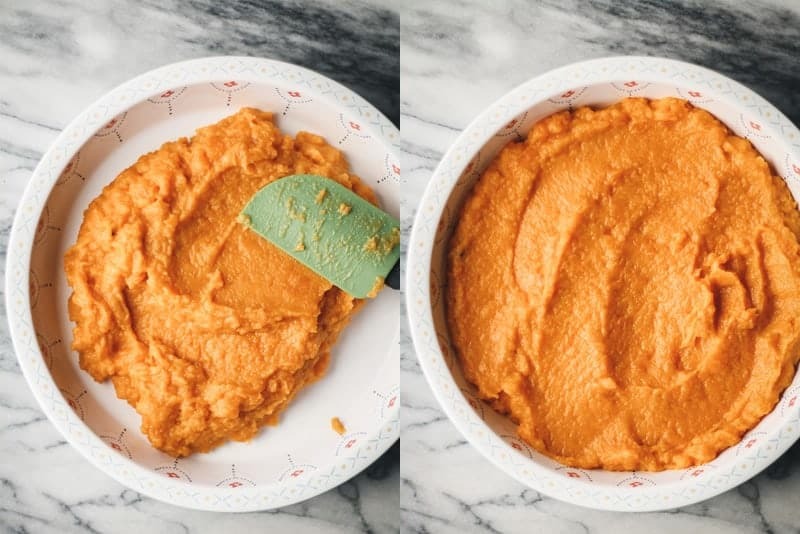 Now that your hand is nice and bandaged, we can mix up the sweet potato mash of sorts. You’re gonna need some butter, brown sugar, and an egg. I tried to go easy on the sugar and butter… because well, we’re gonna get nuts in a minute. So just hang on. Anyway, mash that all up real nice. Ok so this part is kinda fun. It’s time to play with your food a little. Put some cubed butter, gluten-free flour, brown sugar, and cinnamon in a small bowl. Mix the butter in with the other ingredients. To do this, take a cube of butter and squish it between your fingers mixing along the way. When the mixture is somewhat uniform and feels like clumpy wet sand, add in the pecans. Mix in the pecans and then spread the mixture over your sweet potatoes. Next up… bake it! Bake it at 350° for 25-30 minutes. The topping should be slightly browned and the sweet potatoes should be nice and hot. Baking times will vary slightly on the thickness of the casserole and the size of dish you put it in. I mean, come on. Don’t you want to just dive in there?! 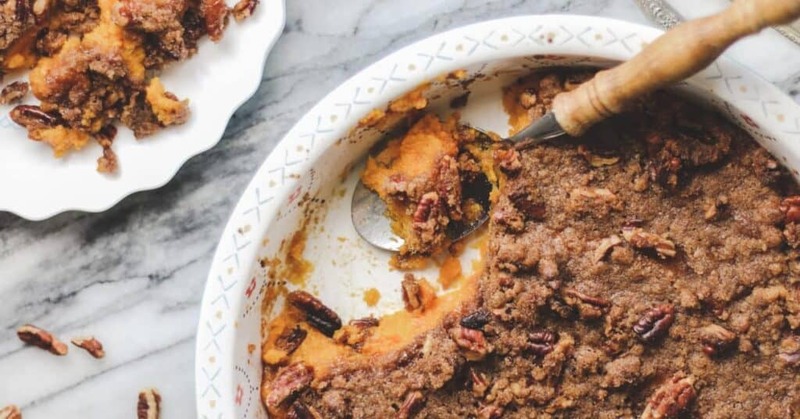 Even people who don’t like sweet potatoes, like this casserole. 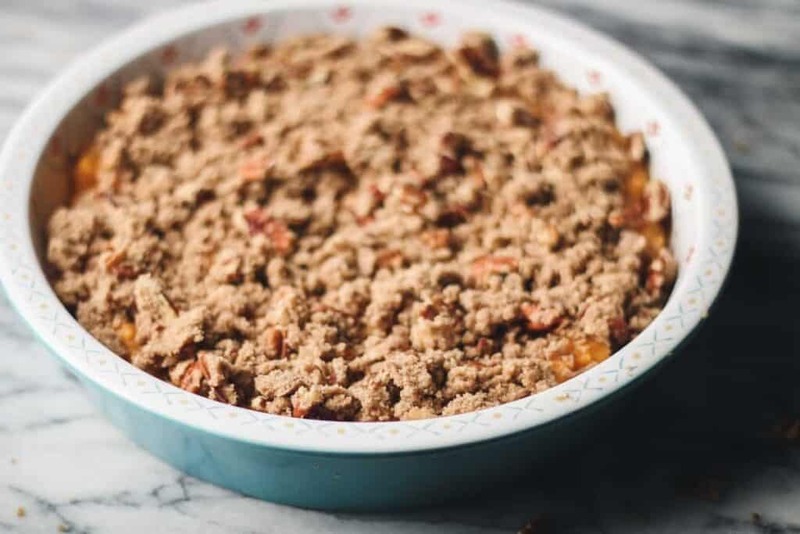 I hope you add Gluten-free Sweet Potato Casserole to your Thanksgiving menu! The most perfect addition to your Thanksgiving menu! 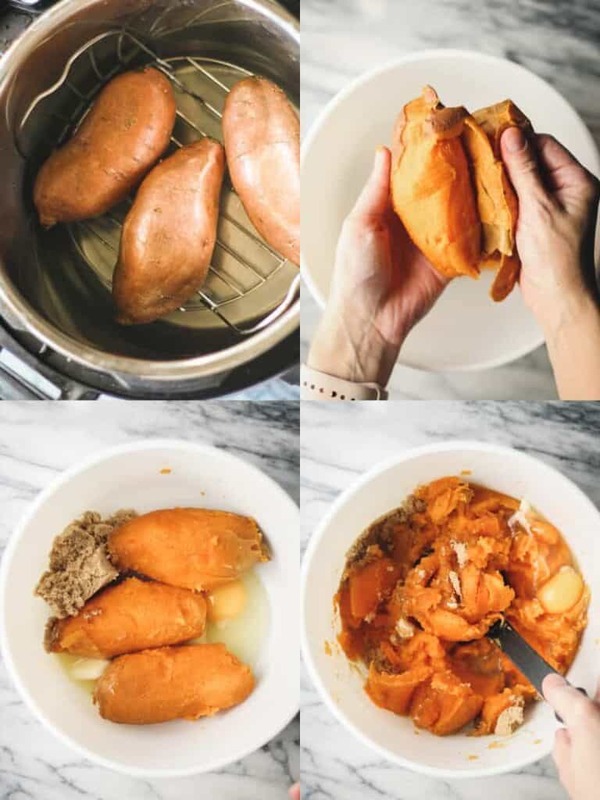 Cook the sweet potatoes by your preferred method (Bake: 1 hr, Instant Pot: 10 min high pressure). Let cool before handling. Peel the skins off of the sweet potatoes. Place them in a large bowl along with the butter, brown sugar, egg, salt, and vanilla. Use a potato masher and mash the mixture. Mix until evenly combined. Spread into a greased, 9-inch casserole dish. Place the brown sugar, gluten-free flour, butter, and cinnamon in a small bowl. Use a pastry knife or your fingers to cut the butter into the other ingredients until the mixture is like clumpy, wet sand. Mix in the pecans. Spread the mixture evenly on top of the sweet potato mixture. Bake at 350°F for 25-30 minutes, or until the top is browned and the filling is hot. Need a dessert? Here’s some cute little pies that would also be a great addition to your Thanksgiving menu! Katie Olesen is a former Clinical Laboratory Scientist turned food photographer and recipe developer. She lives in a small Illinois town with her husband and three children. After her Celiac Disease diagnosis, she focuses on easy and accessible gluten-free recipes that anyone can enjoy. Enter name and email above & tap 'go' to be added to the email list! Who needs the gluten? Looks great.